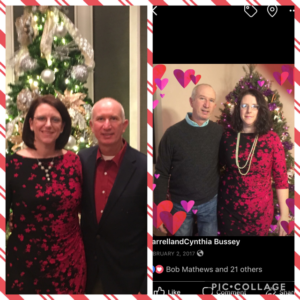 Member Spotlight – Cynthia B. How many years have you struggled with your weight? In some ways, I would say I struggled all my life with my weight. Growing up I was very thin and very active. By the time I was in high school, I choose to limit my food intake drastically to make sure I did not get as big as my mother. I was also an alcoholic at this time. As I progressed to college, I continued to limit my food intake and increase the amount of alcohol. In 1993 I discovered I was pregnant with twins. I started eating and didn’t stop. I went from one extreme to the other very quickly. A few years later I quit drinking (19 years sober today) and I played the substitute addiction game towards food. What was the turning point in your journey? In April of 2017, I had to admit I was a food addict. I gave up sugar, but I couldn’t truly give up everything that I should. I had to confess to my husband about my hiding places of food. I was so ashamed. He had no idea the degree I went to with hiding food. I was still just half committed to getting help though. Then my uncle (he is morbidly obese) had serious health issues and I talked to him about his weight and he said that God gave him a free will and he is using it with food. My mother was morbidly obese as well, and she died due to complications with epilepsy and her weight. Seeing my uncle do the same thing my mother did was a wakeup call to me. Then my cousin, who is my age, had a heart attack. I decided enough was enough. I got serious about it then and I haven’t stopped. How long have you been a member and what keeps you coming back? In September 2018, I decided to see what God had to say about my weight loss struggle. I found the plan on the YouVersion Bible app. After completing that program, I decided to sign up and trust God with this journey. What was your highest weight? Current weight? And when are you projected to achieve your goal weight? In 2007 I was over 200 pounds. When I started WLGW in 2018 I was 190. I currently am at 178.2. My goal is to be at 170 by the end of March and my goal weight of 160 by the end of May. I started in size 14 now I am in 8/10 (I’m 5’8″ tall). How has your relationship with yourself, with food, and with Christ changed? My relationship has changed so much in the situation that I now can say ‘no’ to my trigger foods. I can sit in a restaurant and not even be feeling tempted to have those items. The other difference that has changed is that I’m happy with myself. I no longer see myself as a failure. I have gained the confidence of being the daughter of the King of Kings. I have grown closer to God and lean on Him in newer ways. What advice/tips/suggestions could you offer to your fellow sisters on this journey? The advice I would like to give to the sisters on this journey is to know that you are worth it. That truly submitting this weight loss journey is a must. If you don’t surrender it all to God, then your just doing another diet. God cares about your health and your weight. He wants you to give it to Him. Do you still fear that you will revert back to your old habits and mindsets? I am not sure if I would say that I am in fear that I will revert to the old habits. I would say I am apprehensive that I won’t stumble into the old habits. I only state it that way because I know this is a stronghold for me and it is something I will always need to keep it in check. What’s the most profound principle you’ve learned in the Healthy by Design programs? There are so many principles/tools that I have learned in this program. One is, I am worth it! The other item that I am still in the process of learning is to stop the lies. I have lied to myself for so long. I have come up with so many excuses to explain why I do the things I know not to do. SO, I am learning to stop those thoughts and to replace it with the truth. Aside from your physical weight, what other changes/benefits have you received from taking better care of yourself? There have been so many changes that I have discovered in such a short time. One has been the ability to have the stamina to help my husband on our 6-acre property. Another difference is the ability to resist my trigger foods. In times past, I said to myself that I didn’t have enough willpower to resist. I now know that I can do all things through Christ who strengthens me. Once I had that firmly planted in my head then that changed everything! 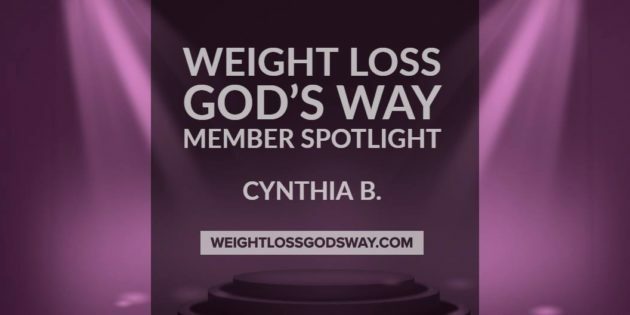 Cynthia, what a blessing to read your testimony! It is so powerful. I am very excited at what God has done in your life and honored by your willingness to partner with me. I praise the Lord He will complete the good work He has begun in you. Many blessings! Thank you so much for sharing your story. This is a blessing and may GOD continue to bless you!